For no really good reason other than it seemed like a good idea, I decided to put a very modest effort into working the Thirteen Colonies special event stations using a Collins KWM-2A transceiver and paper logging. And yes, I didn’t make a clean sweep. But perhaps starting the effort in the last hours and limited actual radio time made that hopeless? Checking spots some of the stations were already QRT or were doing digital, so such is life. It was a blast to run a while on the Collins, and if you look at the picture I had the manuals out to remind me of procedures. Picked up some FIFA station contacts and a couple other special stations. The Transmit/Receive relays and switching are a leisurely compared to the Flex-6700 on the bench with the KWM-2A. But it works and was really fun. In the end I grabbed 10 of the 13+2 stations in quick order. As I worked the 4th and had no radio time all week I didn’t deserve better results. A noble effort in style will have to be the reward! The Island setup is evolving and when not in the radio room will be based on a Maestro with a Touch Screen ToughBook. Here is a quick shot of what I am working on for the Washington Island – Wisconsin QTH’s portable operating position. This is what I will be able to operate from (adding a headset & PTT in many cases) from anywhere I connect with my wireless system there. Paired with the Maestro is a Touchscreen Toughbook laptop to do logging and other site-mobility chores. They will be wireless to the new Flex-6700. ToughBooks are available refurbished under $300 with licensed operating system from Toughbook Tech. Built strong enough to be a aircraft wheel-chock! Ruggedized touchscreen does better with the stylus than finger jabs, which is a contrast to the Maestro touch screen sensitivity. For activation of smaller islands the Maestro & Flex-6700 will stay behind, with the Flex-6300 then being paired with the Toughbook via SmartSDR for Windows. For antennas I have several choices there. Typically I have been using a SteppIR CrankIR with the Flex-6300 for island activations other than the main island. I have several other portable antenna options. On Washington Island itself I have a proper antenna farm in the works. As I am rethinking this whole setup you’re invited to follow along as I rework plans. Still to come is a mobilization preparation of the Flex-6300 to keep everything needed together and protect it from some level of adverse weather while out on the smaller islands. 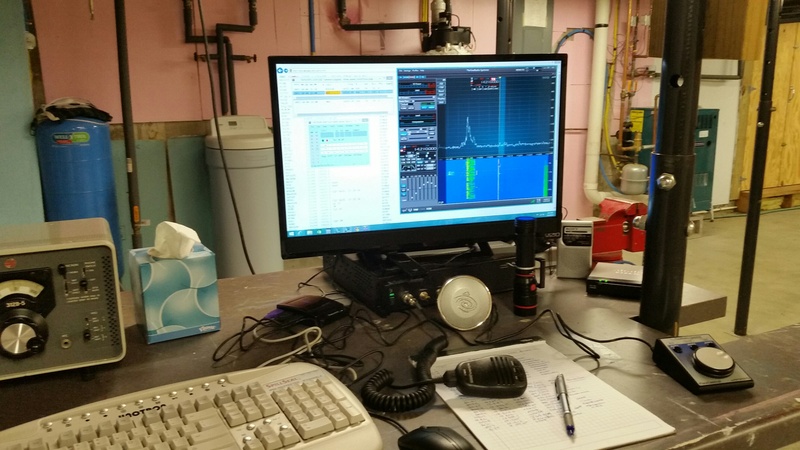 Pictures and much of text was originally posted at the FlexRadio Systems Community forum as I described my first weekend Maestro excursion. Okay, just like a Flat Stanley, where have you taken your Maestro to go do radios? Snapshot is quick shot off the ferry boat to Washington Island, Wisconsin (US Island WI-001L) where this weekend it will be a quick overnight running a Flex-6300 with a SteppIR CrankIR antenna. Weather is a bit edgy though I hope the wind drops and drizzle stops long enough to get the antenna setup yet today. With it sleeting out who knows? So where has your Maestro gone? Wild Board standing guard over a Maestro near the table edge. The Flex-6300 needed a software upgrade to run with the Maestro. The strong signal is George W9EVT who live about 3/4 a mile away. George W9EVT is about 5000 feet away and his signal shows it! Bands have not been good and highly variable. Definitely seeing my antenna limitations holding QSO count way down. Have been playing with also running K6TU iPad control and on the Win10 box other programs like DDUTIL alongside the Maestro. Off for coffee and church, hopefully my rate will improve afterwards. Steve, your making me nervous. The Maestro is too close to the edge of your table. Nice pics. And I replied: Thank you. The Maestro with tilt feet gives such a solid feel that you spotted how I crept it up near the table edge. Didn’t seem as worrying in the flesh as in photos, and certainly is an interesting phenomena as I try to be careful. Running a vertical wire antenna in this weekend’s bands wasn’t a highly productive exercise. Would have twenty-thirty signals on a band, then only a few weak traces and all over between extremes. Snowed and deleted, so never got the Maestro outside either. The Flex-6300 station got great reports today using a SteppIR CrankIR portable antenna. Mostly CalifornyQSO party station but also worked some DX. The PC on a stick was an experiment that has worked out fine, and I will leave it for the time being. When the 6300 is swapped for a 6700 I’ll put in a full PC. I’m not happy with the included Flex hand microphone but forgot to bring a desk mic up this trip. Once the permanent antennas are up it is going to be obvious that I will want a Flex-6700 here rather than the limited single SCU Flex-6300. The 6300 will go to my traveling radio setup at that time. Made a interesting contrast to last weekends QSOs done with the Collins KWM-2A station on the same antenna. Eventually I intend to move the late Collins setup in this picture to my home QTH and bring up the S-Line separates set up. This “Round Emblem” combined transceiver with external VFO for split operations is the final itineration of the S-Line series and was sold new in the mid/late 1970s. The other Collins station I own is a “Winged Emblem” first of the S-Line series with separate receiver/transmitter. That station is a 32S-1 transmitter, 75S-1 receiver, 312B-4 station console, 30L-1 amplifier, separate speaker and a power supply. The receiver/transmitter track each other usually. It dates from 1958 to 1960 from dating the serial numbers. It has amazed me how many complex cables interface the various units. There are roughly a dozen cables in the KWM-2A station and about five-six more in the twins S-Line one. Many are simple, but some are complex and some are uncommon – things like RF coax with RCA plugs….. The microphone jack is a military size and I had to source some as spares. The KWM-2A station got great reports today using a SteppIR CrankIR portable antenna. Even worked some DX. The audio has that warm friendly tube-amp sort of sound. Got great reports which I have to admit surprised me. I hadn’t expected it as there are so few adjustments possible compared to a modern rig. I’m not happy with this particular SM-1 microphone and did make most contacts using an Astatic D-104 “lollipop” microphone instead. The SM-1 will go off for service. I have a good ways to go in learning to use this gear, but as much fun as I had it is worth the study and practice time to get it right. Made a interesting contrast to this weekends QSOs done with a barefoot Flex-6300 on the same antenna. 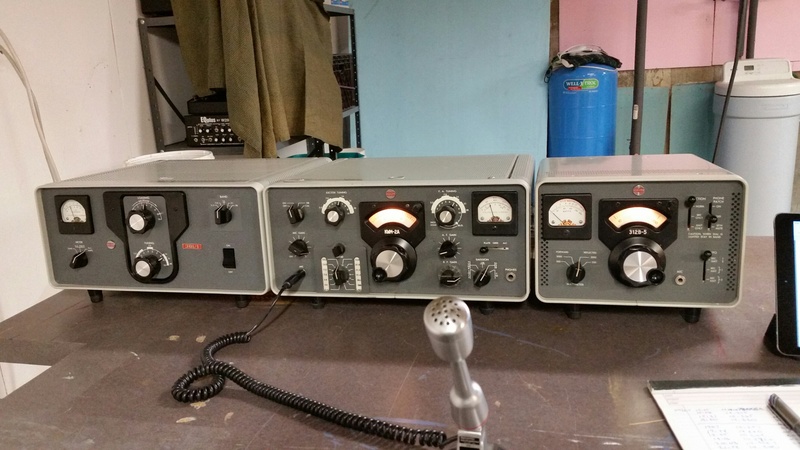 It is obvious the new Washington Island QTH is a FlexRadio System Station first and a Vintage Collins Station second. I’ve done a quick sketches how the layout will work. HF Multi-Band Receive only – KD9SV RBOG (Reversible Beverage On Ground) units, aimed NW, SW, NE, and SE, using a convient existing buried pair of high grade 72 ohm cable to feed. Feedline will be Andrews Heliax I now have on hand.